The Neutron Economy: Where's the real bottleneck for natural gas? Distribution. Do you think that gas marketers have never noticed this effect? Do you honestly believe that they think it is "insane" that they can occasionally sell every therm they can deliver at prices WAY above the price that they paid to purchase the gas? No recent news has disabused me of the theory that the major pushers behind the efforts to shut down Northeast nuclear plants are people who make a ton of money by selling natural gas and distillate fuel at prices way above their cost of production. They have rented (or purchased) some very effective politicians to carry their water. The thing I still fail to understand is why there are some otherwise reasonable people who seem to care about the cleanliness of the environment who are going along with the pro fossil fuel effort to destroy electricity production facilities that run on uranium instead of hydrocarbons. @Rod: I have little doubt natural gas marketers have a significant financial interest in creating new demand by knocking out competitors by exploiting the force of the government. This is not exactly a surprising claim. I do think you're missing the basic economics of supply and demand - the highest marginal price per unit is not necessarily the profit-maximizing one, namely because it depends upon the elasticity of demand - but whatever. A feature to notice is that this situation only arises when pipeline capacity hits near-full utilization - in other words, it's a price signal for to build more pipelines. 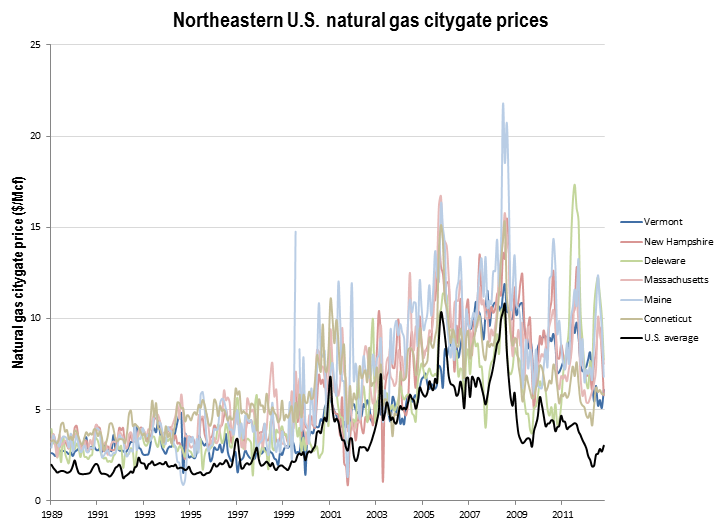 But in any case, I'm not trying to convince natural gas marketers: I'm making the case that on a pure economics standpoint, dumping pre-existing nuclear for natural gas makes zero sense in the Northeast, something which may not be completely obvious if one only pays attention to the spot price of natural gas. 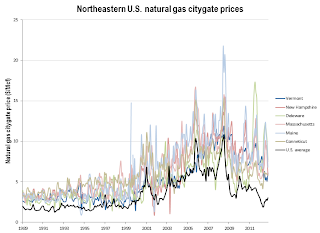 This is the whole point, and one which I'd hoped you of all folks would appreciate - namely that the price of gas is much more controlled by regional variation than is commonly reported, at least in the Northeast. This, in my mind, is a far stronger argument against gas than hypothetical future arguments about price - namely because the data is here in the present and pretty unambiguous. 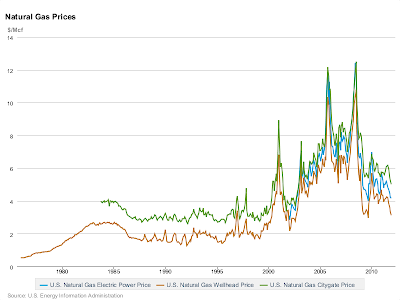 BTW - I just want to remind you of the terms of our wager - my contention is that natural gas being sold to US electricity generating customers will be trading for more than $10 per MMBTU for at least one month before the end of 2014. The specific table I am intending to use as the metric is located at http://www.eia.gov/dnav/ng/ng_pri_sum_dcu_nus_m.htm; the row I am referring to is the bottom row labeled "Electric Power Price". 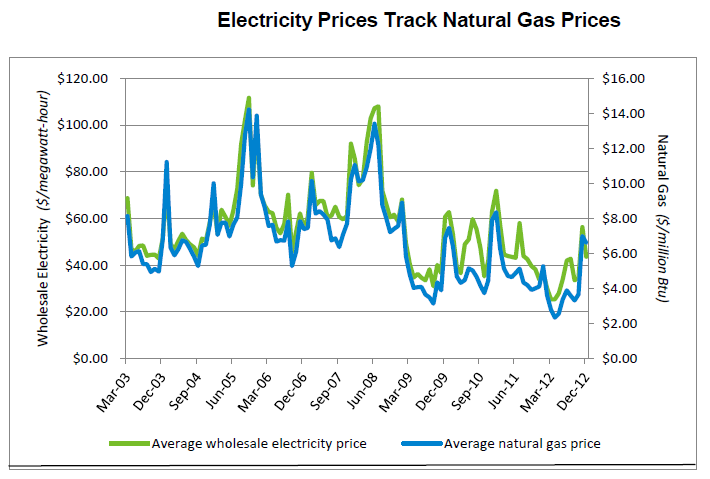 That particular metric is calculated based on averaging out the prices that electric power generators pay. When there are delivery constraints and the generating companies have decided against purchasing sufficient long term contracts, the elevated spot market prices get reported. Therefore, the analysis underlying my bet is not about the "raw commodity" price or reflective of my estimates about the available resources in the ground. "@Steve – here is a public wager. 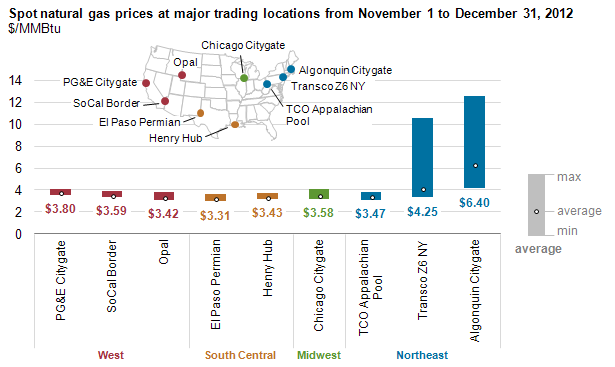 By the end of 2014 there will be at least one month in which the price of natural gas at Henry Hub will exceed $10 per MMBTU. The bet is $50. Are we on?" "@Joel – the bet is for one month with a reported average price at Henry Hub of $10 per MMBTU by the end of 2014. That level will be enough to destroy some demand, so I am not sure how long the level will last. I could have slanted the bet more in my favor by picking New York City gate as the delivery point or by stretching the period until the end of first quarter of 2015, but I’m still pretty confident. It would be wonderful if I was wrong, but I don’t think that’s true." 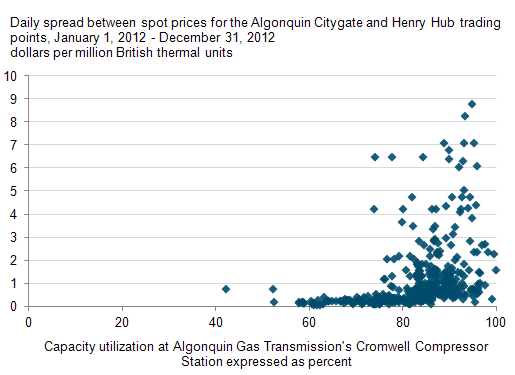 The price at Henry Hub *is* the commodity price, and the one you originally stated in your bet. You may have intended to bet about the retail electricity cost (an obviously more favorable bet to you), but that is not the assertion you originally made, nor is the average electric cost in any way equivalent to the Henry Hub price. And that's the whole point of the post, which I'm surprised that you seem to have missed - I have no dispute that citygate prices in a congested distribution region like New York will potentially spike. However, my bet was that the raw commodity price would stay relatively flat. Your original assertion was that they were not. 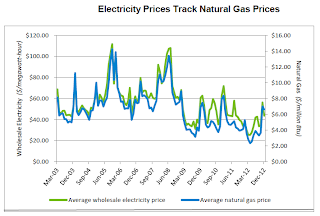 "I have a public bet with one of my readers that natural gas being sold to US electricity generating customers will be trading for more than $10 per MMBTU for at least one month before the end of 2014. Would you like to make a similar wager?" I should have written a special post or at least put the original bet in a more searchable form. The market still provides me with some confidence that I have a chance to win the wager, just a lower chance than I thought.